Residents search for belongings from their charred homes after a fire at a residential area in Quezon City, the Philippines, March 6, 2019. Around 150 houses were razed in the fire, leaving 450 families homeless. GOVERNMENT funding for the country’s rice industry is set to hit a record of 22 billion pesos ($421.531 million) this year with the implementation of the Rice Import Liberalization Law, the agriculture chief said. More households in the Autonomous Region in Muslim Mindanao will soon have access to safe and potable water through a USD2.6 million-worth project that will build a community-based water supply in the region. Finance Secretary Carlos Dominguez 3rd on Wednesday said the government is optimistic that the Philippine economy will expand by 7 percent or higher this year despite external challenges. The number of measles cases in Western Visayas increased by 1,773 percent in the past two months compared to the same period last year, according to the Department of Health (DOH) regional office. The National Food Authority Council (NFAC) has approved the amended implementing rules and regulations (IRR) of the rice tariffication law, which gives the assurance the NFA will continue to buy from local farmers. Japan and the Food and Agriculture Organization (FAO) of the United Nations will start implementing their USD1.76 million agricultural training program for the Bangsamoro region in March 2019, the FAO announced Wednesday. 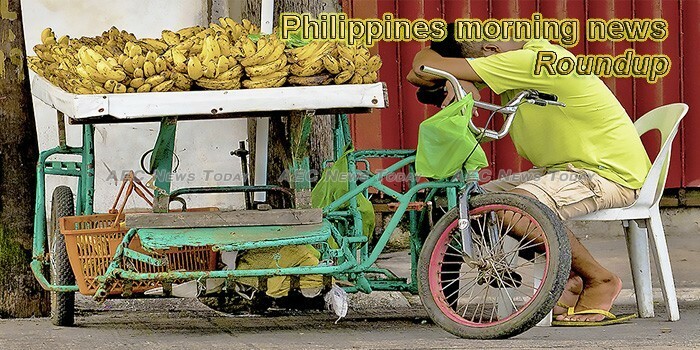 The Philippines reversed 12 years of underspending in 2018 and exceeded its deficit goal “slightly,” driven by spending on public infrastructure and personnel services, outgoing Budget Secretary Benjamin Diokno said Wednesday. Overheating risks for the Philippine economy have diminished and the country is expected to continue posting above 6-percent growth, an International Monetary Fund (IMF) official said on Wednesday. Beijing last night downplayed the renewed commitment of the United States government to come to the aid of the Philippines once it is attacked in the disputed South China Sea. NATIONAL GOVERNMENT infrastructure and other capital outlays exceeded the 2018 program, driven by road and bridge networks, flood control projects and military modernization among others, despite a drop in December, the Department of Budget and Management (DBM) reported on Wednesday. Up to 300 Philippine people die from rabies disease each year, according to the World Health Organization (WHO), prompting the Philippines to launch an anti-rabies campaign this month. A Department of Transportation (DOTr) official admitted on Wednesday that the delay in the passage of the proposed 2019 budget has affected several big-ticket infrastructure projects, including the Metro Rail Transit 3 (MRT 3) rehabilitation project, Metro Manila subway construction and the North-South Commuter Railway connecting Tutuban, Manila, to Malolos, Bulacan. The government approved a P10 increase in toll along the North Luzon Expressway effective March 20, or seven years after operator NLEx Corp. first applied for the periodic adjustment. The rehabilitation of the Metro Rail Transit Line 3 (MRT-3) is still on track to meet its 26-month completion target amid pending enactment into law of the 2019 national budget, a Department of Transportation (DOTr) official said on Wednesday. Finance Secretary Carlos Dominguez III said Wednesday he expects to collect P3 billion worth of income tax each month from foreign nationals working in Philippine offshore gaming operations. Some stations of the Metro Manila Subway System will rise on government properties to ensure that it is accessible to the riding public and to increase the value of land surrounding them. Malaysian Prime Minister Mahathir Mohamad arrived in Manila for his two-day visit, a trip that will include a meeting with Philippine President Rodrigo Duterte. The Department of Environment and Natural Resources (DENR) said its rehabilitation efforts for Manila Bay got a major boost after San Miguel Corp. (SMC) agreed to clean up the Tullahan-Tinajeros river system, one of the major river pollutants in the bay. Ranking defense and military officials on Tuesday inked a Memorandum of Agreement (MOA) with the Philippine Economic Zone Authority (PEZA) on the conduct of reserve corps training for the agency’s personnel, in line with the ongoing efforts to beef up the country’s reserve force. Negros Occidental, including this city, registered 1.76 million in tourist arrivals by end of December 2018, a 2 percent increase compared to the 2017 figures. United Nations High Commissioner for Human Rights Michelle Bachelet issued a statement slamming the Philippines’ deadly war on drugs and urged the government to take a “public health approach” to comply with human rights standards. Former presidential political adviser Francis Tolentino has asked the National Disaster Risk Reduction Management Council (NDRRMC) to declare a state of calamity that will allow it to access calamity funds for activities that will lessen the effect of the El Niño or the dry spell. A USD25-million state-of-the-art business aviation parking and maintenance facility will soon be built at the Civil Aviation Complex inside this Freeport zone. Industry monitor OpenSignal appears to corroborate a recent report by Ookla Speed Test showing Smart being ahead of its internet speed race against Globe. The Palace on Wednesday, March 6, said President Rodrigo Duterte will not interfere in the “intramurals” in Congress over the national budget for 2019. Japanese consultants from the Japan International Cooperation Agency (JICA) on Wednesday presented to the planning office of the Department of Public Works and Highways (DPWH)-7 (Central Visayas) the preparatory survey for the new Mactan bridge construction project. The dry spell has taken its toll on farmers in 24 of the 40 villages of this city, the city agriculture office said Wednesday. Eleven of the cities in Southeast Asia with cleanest air are in the Philippines, with Calamba in Laguna taking the top spot. President Rodrigo Duterte on Wednesday said he wants to sit down with officials from the Office of the Ombudsman and the Commission on Audit (COA) to streamline auditing procedures. Hong Kong-based Metrojet Ltd. is spending $25 million to build its largest business aviation parking and maintenance facility in Clark, which will become the firm’s regional hub. A SENATE committee reviewing the implementation of the K to 12 curriculum has called for measures to improve the basic education system and to better match school training with the skills in demand from industry. Around two millions Filipinos are added to the Philippine population every year, the country’s Secretary for Socioeconomic Planning Ernesto Pernia said on Wednesday. The Philippines and Vietnam have adopted on Wednesday a new five-year plan of action mapping specific commitments the two nations will jointly undertake to bolster various areas of cooperation. Newly appointed Bangko Sentral ng Pilipinas Governor Benjamin Diokno laid down yesterday his priorities at the central bank after relinquishing his post as head of the Department of Budget and Management. Term deposit rates fell across the board as banks, armed with excessive funds due to strong inflows, continued to swarm the term deposit auction facility (TDF). Lacson: Is it gov’t policy to condone other countries’ invasion of Filipinos’ privacy? Senator Panfilo Lacson on Wednesday lambasted the Palace’s claim that the administration’s narco list is based on intel from foreign governments obtained from wiretaps. The Commission on Human Rights on Wednesday, March 6, urged the Bureau of Corrections (BuCor) to improve jail management instead of implementing a “blanket punishment” that can affect the physical and mental health of prisoners. A 5.5-magnitude earthquake struck Surigao del Sur on Wednesday, March 6. The Philippine Institute of Volcanology and Seismology said the quake struck 102 kilometers northeast of Hinatuan at 8:12 a.m.
Defense Secretary Delfin Lorenzana has ordered the military to validate a report Filipino fishermen were harassed by Chinese vessels near Pag-Asa Island in the West Philippine Sea. The entire anti-drug team of the Pasay City Police Station 1 was sacked on Wednesday, March 6, after allegedly extorting from the family of a detained drug suspect in exchange for freedom. Manila Archbishop Luis Antonio Cardinal Tagle urged Catholics to leave behind unnecessary bags and baggages as they begin the penitential season of Lent through the observance of Ash Wednesday, March 6. Winning candidates in the May 13 midterm polls will not be proclaimed and cannot assume office if they fail to file their Statements of Contributions and Expenditures (SOCE) on time, the Commission on Elections (Comelec) disclosed yesterday. The newly-launched Jojo Pasabay mobile delivery app has an interesting new way of transporting products: it connects users to transporters who are already heading towards the drop-off location of their package. The Philippine National Police (PNP) has reshuffled over 1,000 police officers who have close ties to candidates running in the midterm elections. AN ecstasy dealer was gunned down at past noon on Wednesday after attending a court hearing in Cebu, police said. Ensuring the success of the Bangsamoro government in fostering peace and development in the new autonomous region is the single most important goal of counter-terrorism efforts in the Philippines, a Jakarta-based think tank said. Philippine National Police chief Oscar Albayalde on Wednesday, March 6, sacked a police director and a chief of police following the arrest of some of their men for alleged extortion. FORBES Magazine on Tuesday, March 5, named business owner and former senator Manuel Villar as the richest Filipino of the year. The Flood Early Warning Device developed by Mariner’s Polytechnic Colleges Foundation (MPCF) for Brgy. Mangayawan, Canaman, Camarines Sur that automatically alarms when flood water rises to signal constituents when it’s time to evacuate their place. President Rodrigo Duterte on Wednesday joked that his daughter Davao City Mayor Sara Duterte should be jailed for punching a court sheriff nearly eight years ago. Social Security System (SSS) president and chief executive officer Emmanuel Dooc has submitted his resignation to President Duterte following the expiration of his term upon effectivity of the new Social Security Law. Megaworld Corporation, the Philippines’ largest office developer and landlord, has bagged a landmark deal to host the first Philippine location of US-based WEWORK’s collaborative workspaces.